Going inside the Sea Life Centre you are greeted by friendly staff, and instantly immersed into an underwater world. 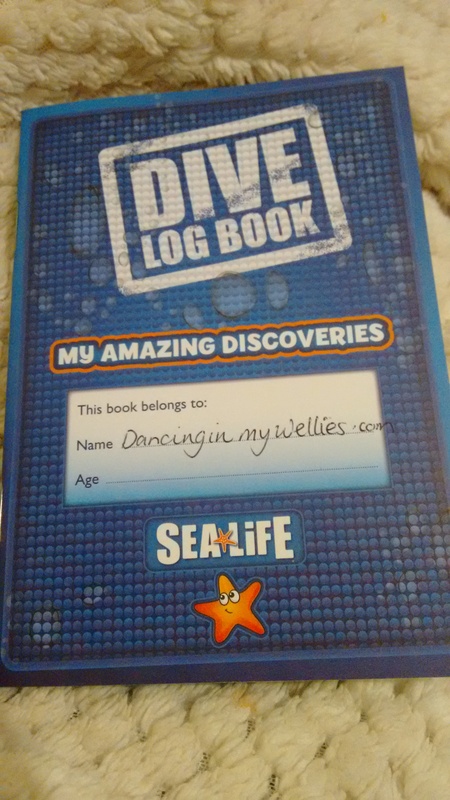 Our children love aquariums, and so they were hugely excited to be visiting the Sea Life Centre, even more so when they were handed a “dive log book” to help them spot facts and collect the stamps as they walked around. The dive log books were a great idea, as it kept the younger children focused on what they would find next. We spent a lot of time looking at the rays, the tank is fantastic as you can look through the glass or over the top into the tank. Rays are so graceful, and the children found them funny as they look as though they have smiley faces on their underside! Near the rays, there was an area where you could get close to some Sea Life, and my eldest son was delighted to have a go at this, he was much braver than I would have been at his age! It was quite magical to see Penguins in Great Yarmouth, they have a wonderful enclosure which is partially outside! The outside bit can be viewed by walking up a small flight of steps, and then you look down on the penguins, who were enjoying the warmth of a sunny Autumn day when we visited. Viewing the penguins from inside you get to watch them swim underwater or toddle along the rocks, it was probably the busiest area of our visit, with lots of families spending a great deal of time watching each of the penguin characters! The most exciting feature at the Great Yarmouth Sealife Centre for me was the Giant Turtle and Shark tank. Since having snorkelled with sharks at the London Aquarium I have become really interested in them, sharks are incredible! The sharks at Great Yarmouth are still young, so look small and harmless. A fully grown shark can be quite intimidating to look at I think, but these juvenile sharks the children loved looking at! I hope that my children will learn that sharks are beautiful creatures, and not ones to fear. We watched the sharks being fed, and the wonderful talk by a member of staff really helped explain how sharks aren’t actually as dangerous as we believe. Clever props hanging from the ceiling showed us how a man on a surf board looks much the same as a seal if you’re a shark looking upwards. The Sea Life Centre has a large shop and cafe with soft-play, so at the end of your visit you can relax a little longer and enjoy views of the sea from the warmth of the cafe! Ticket prices are quite high, you are free to leave and come back again later the same day which I think is a great idea as you could break up your visit with a walk along the beach or a cup of tea at the cafe. It is a great day out, which is fun but educational too, and a perfect activity if you are visiting Great Yarmouth during the colder months as I think the penguins will be even more impressive as the weather gets colder!